As an artist, I have long been inspired by remote environments that thrive in extreme conditions and transform our understanding of life. 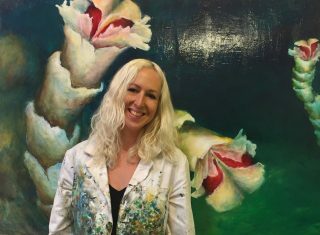 Enveloping the viewer in atmospheric, outsize scenes of bizarre sea creatures and remote habitats, my paintings aim to evoke the immersive experience of exploration and discovery. I am thrilled to be joining this cruise as we explore a range of environments, hundreds of meters down. Our first dive takes place at one of the most extraordinary landscapes I’ve ever encountered. Like many other deep sea seeps, the Point Dume Seep hosts microbes that oxidize methane and transform it into energy in a process called chemosynthesis. Fuzzy areas of microbial mats or highly textured carbonate rock (a byproduct of the chemosynthetic microbes) are typically found at most methane seeps. But at this site, the microbes produce large biomorphic structures that seem completely fantastical. 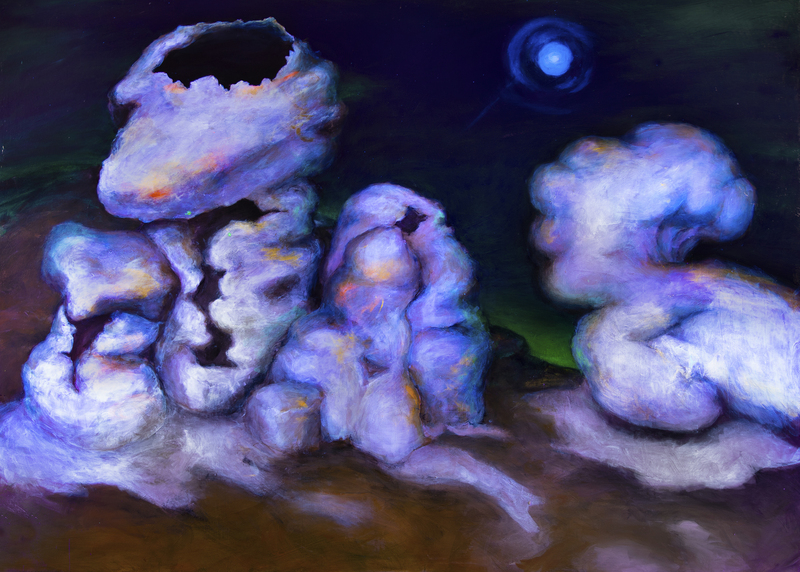 This painting (“The Dream, Point Dume Seep”, 2018, Acrylic on canvas, 60 x 84 inches) features the surreal structures formed by chemosynthetic microbes at the Point Dume Seep, which we briefly visited on a previous research cruise. I am so excited to return to deepen my understanding of the site and create more detailed paintings of its unique features. I was lucky enough to visit this site once before on the E/V Nautilus, but our work was brief and sampling was minimal. On this cruise aboard the R/V Falkor, I am delighted to have the opportunity to work alongside Jeffrey Marlow, who is researching why these structures form in such a distinctive way. Observing and assisting with aspects of his field work will enable me to gain a more nuanced understanding of the questions scientists have about this site. This depth of knowledge shapes the paintings themselves, and ultimately enables me to communicate a better picture of my subjects’ scientific significance. Using Jeff’s samples as models will allow me to observe the details of these structures, and bring a greater richness to the final painting. While we have much to learn and discover about this seep, we do know that these methane-oxidizing microbes are the building blocks of a rich ecosystem in the deep. I will have a chance to observe and paint many other denizens of this chemosynthetic-based community—specially adapted clams, worms, and anemones—as they are collected and studied. Again, working from direct observation will be invaluable, as I magnify these creatures to human scale and translate their unique movements, textures, and colors onto the canvas. In addition to enabling other life forms in the deep sea to thrive without light or plants, chemosynthetic microbes sequester methane that would otherwise escape from the seafloor into the atmosphere. Methane, known to most of us as a greenhouse gas, is 30 times more powerful than carbon dioxide when it comes to trapping heat. Once characterized by isolation, these specialized ecosystems have face increased connectivity as a result of human activities, such as oil extraction and seabed mining. Disruptions in these deep-sea communities could lead to extreme impacts on earth’s entire climate. As a painter, I aim to highlight the aesthetic, scientific, and environmental value of these worlds. At the moment, I am taking advantage of our transit period to prep my work station—securing my easel (so that it doesn’t tip over in high seas) and covering my work area in plastic to protect the lab from paint splatters. Once the dives begin, I will be working nonstop: standing watch, assisting with sample processing, and painting. 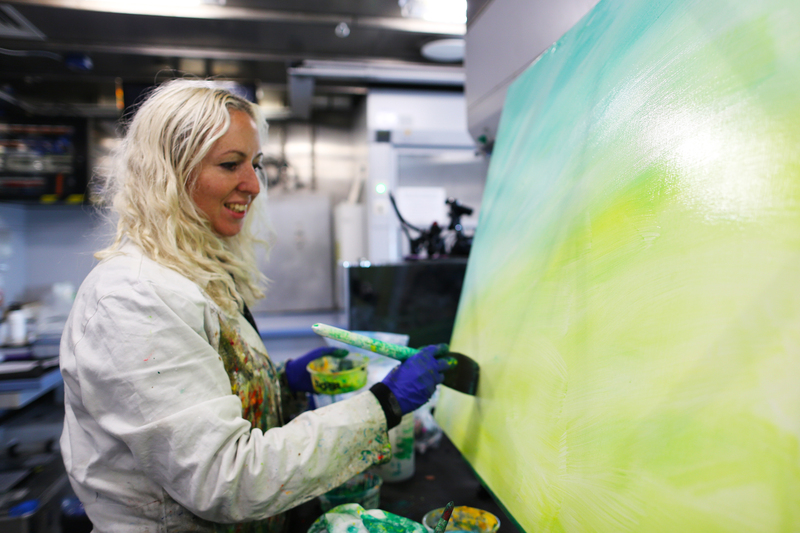 Follow #BackyardDeep to see images of my painting process and the works in progress. 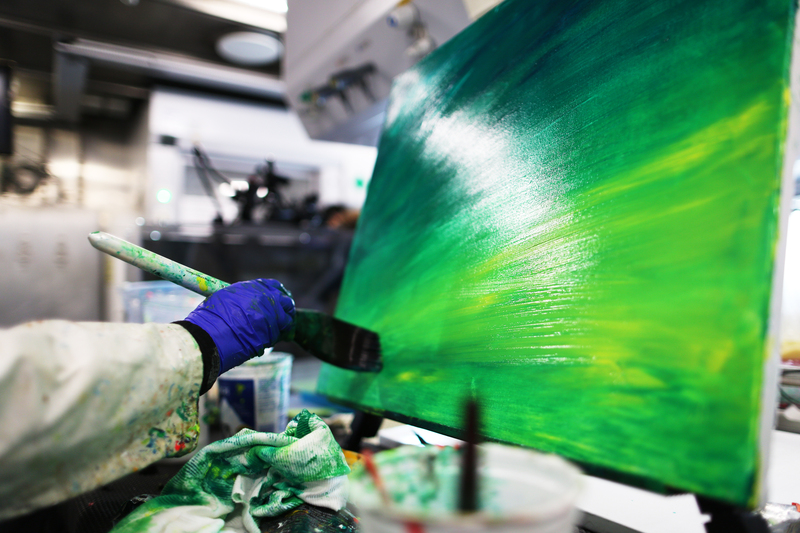 Lily Simonson begins painting a background for one of her pieces.